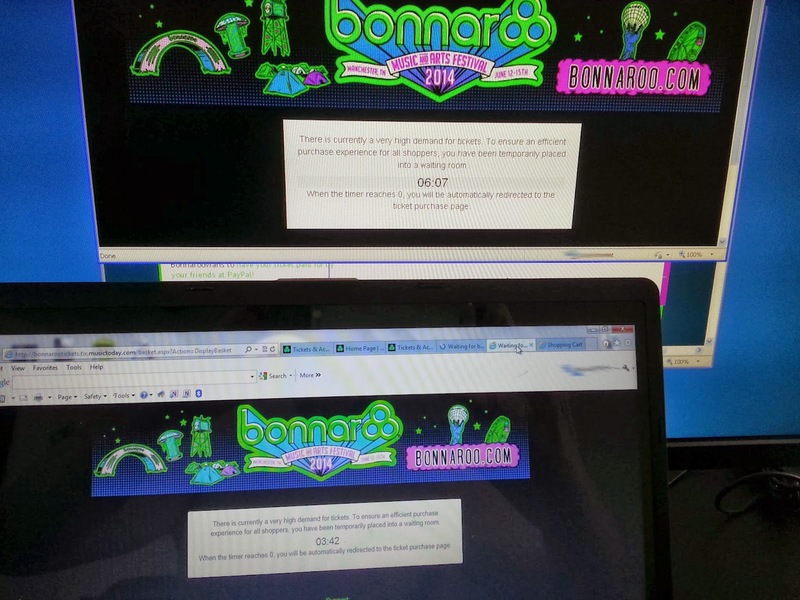 So as I just blogged about the time and frustration it took to finally purchase Bonnaroo tickets after waiting online for 1 hour and 22 minutes, I feel I need to vent a bit further on my frustrations. I understand the bigger the festival, the higher demand there will be for tickets. Obviously as a part of the "Big 4" festivals, I knew what was to be expected when I went the website this morning before the release. 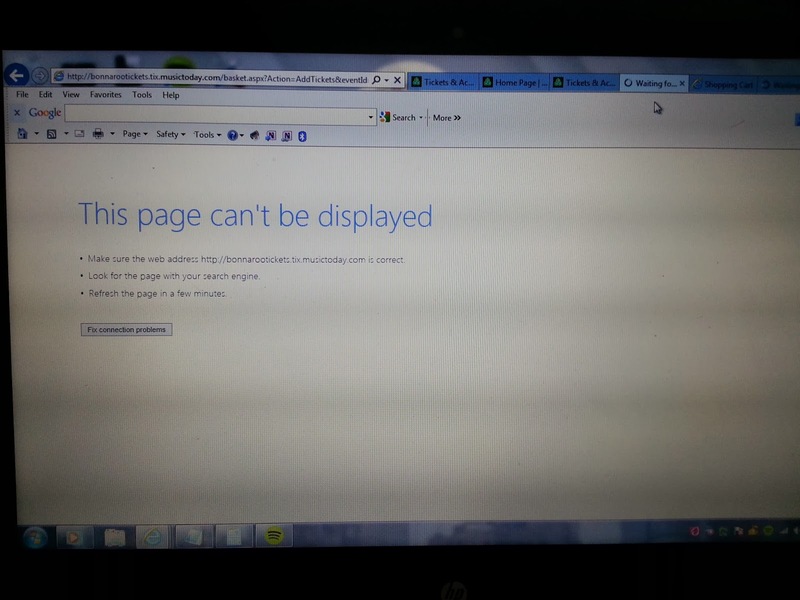 That is why I went to the Bonnaroo home page on three different computers in addition to my phone to set myself up for the chance to get in to buy tickets first. I had to prepare myself for a long haul though as festival ticket releases can be a taxing event for the festival goer. 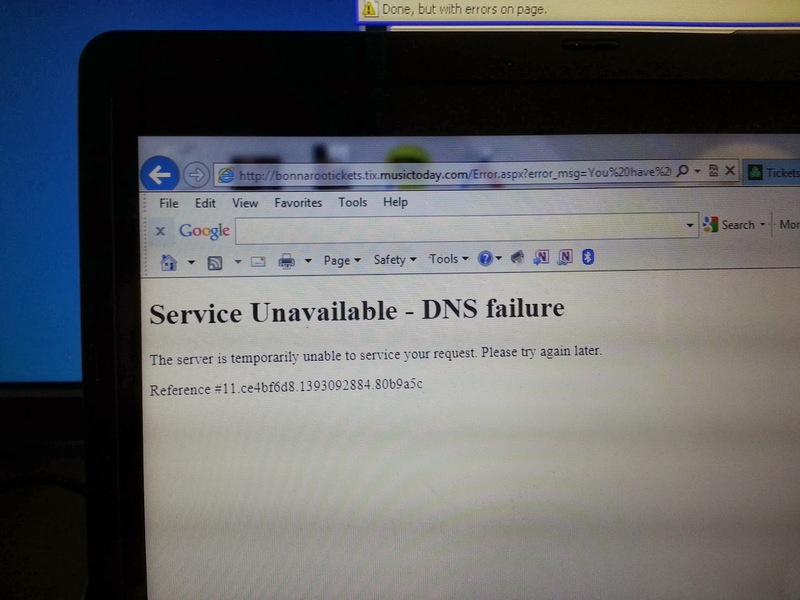 I knew I could expect the wait queues, DNS errors, "this page was not found", and HTML coding pop ups. Even when I got to the point where I could see tickets in my basket, it wouldn't let me buy them. One has to wonder if there is a better process for major events like this? I am not a website developer nor have I ever dealt with trying to sell tickets to an event this massive, so I am not judging those that put the websites together. The festival organizers have to know what will happen the moment the second hand hits the top of the hour and people start refreshing their browsers. This has happened to me several times in the past and not just for big festivals (tickets Dark Lord Day at Three Floyds Brewery comes to mind). But a festival of this size should be more prepared for an attack on the website shouldn't they? 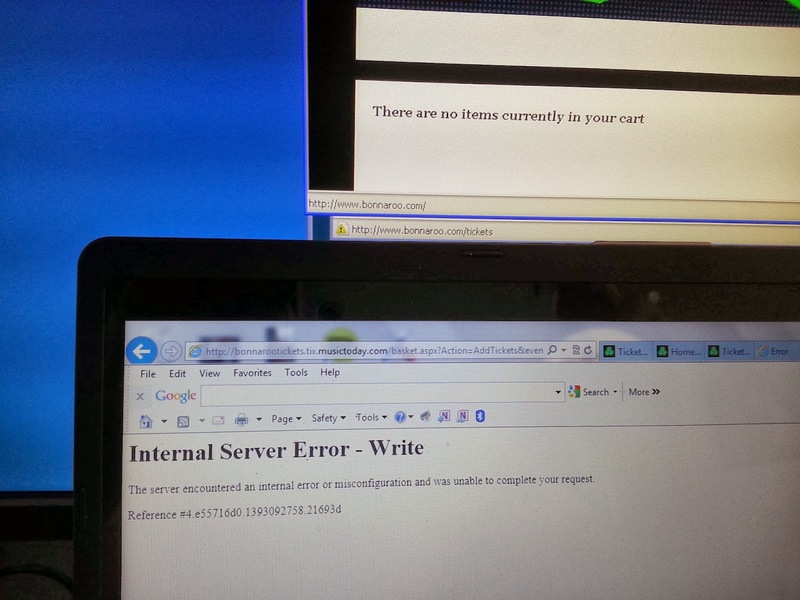 I understand they outsource ticket sales to third party ticket sites, but shouldn't those sites be prepared too? I have gone through this awful experience with Lollapalooza and Coachella tickets before. Last year, it took about 45 minutes to an hour to get into the purchasing site for Lolla. Tickets also completely sold out within 90 minutes. I got into Coachella's website within 30 minutes and they sold out in less than an hour. Those festivals get as much traffic as Bonnaroo, yet it seems like they can handle it a bit better. Coachella even has to account for two weekends in its ticket releases. I think its time to come up with a lottery, apply better re-sale regulations or simply do staged ticket sales. The current process can take its toll on someone who is waiting an hour and a half to cough up $300. I mean think about that. Isn't it worth the investment for the festival to apply a better platform for its faithful patrons? Until that time though, I guess I just have to sit back and take it in front of my laptop and yell obscenities every time I get a "There is currently a high demand for tickets..." message. I just wish the big festivals would have the same high demand of providing customer satisfaction.